It’s all coming together nicely, I’m nearly afraid to say that in case i’m struck down with an injury. Training is in full swing and I am well used to getting a soaking in this very wet weather we have been experiencing. 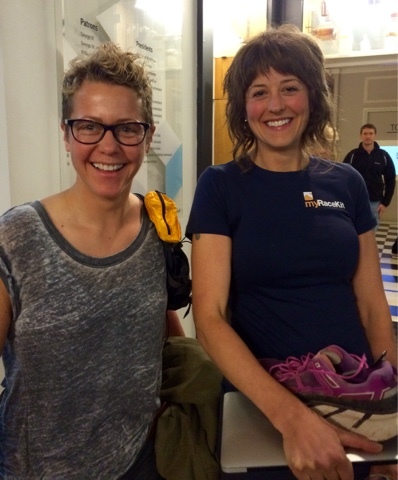 I ventured across the water to London for the MDS Expo where I was keen to hear two speakers. James Cracknell who gave a great talk and threw up some valid points on how your mind and body are linked when we do crazy things and Elizabet Barnes who won the race last year. She was fantastic and really gave me food for thought on what my goal was for the race. Before it was just to finish but now I know it needs to be more that this. It was a good weekend and I took a lot from it. Last years winner Elizabet Barnes. I was a little star struck. During December I completed the ‘Marcothon’ (Minimun 25 minutes or 3 miles every day of the month). I was able to get some brilliant sand training in Donegal as we were away for a week over Christmas. Sand really saps the legs and throw in a few big dunes to kill them off completely. I got to explore Ards Forest beach and trails and would recommend it as a stop either with the family for a stroll or a longer trail/beach walk. Throughout December I clocked up over 140 miles with 11650ft of elevation gain. My MDS sessions started too with three structured sessions in a week. I also add in some runmute’s (running to work) which is an 8mile round trip once or twice a week depending on how tired i’m feeling. I really dislike the route but it’s a chance to run with my pack with weight in it due to the food and clothes i’m carrying. Podcasts make this more bearable and ‘stuff you should know’ and ‘desert island discs’ are making the miles go in quick enough. I have got all sorts of factoids in my armoury now to bore friends with. Who knew we actually do need our appendix’s.The big decisions about kit have been made. Backpack, sleeping bag, runners, socks, underwear, shorts and T shirt. Of course there are lots of other pieces of kit and tech but these are the ones that if they are wrong will cause me the most pain or discomfort. 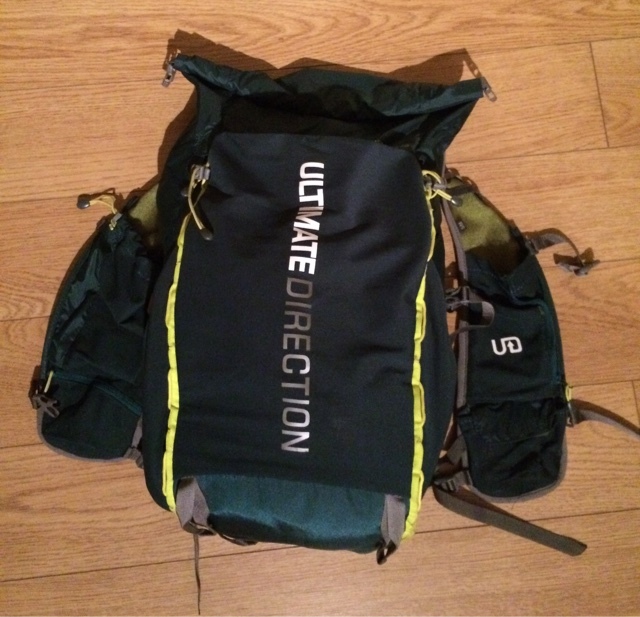 Pack – I went with the Ultimate Direction Fastback 20l. Last years winner Elizabet Barnes wore this and after a very good service from My Race Kit (she owns it) I decided that if it was good enough for her then it was good enough for me. Plus it gets top marks as a great female specific fit. I wore this on the Mourne 2 day marathon and loved it. Sleeping bag – OMM Mountain raid 1.6 bag. I will add a silk liner to this as I know I like my heat and the temperatures drop at night in the desert. It’s a very light bag with primaloft one insulation. Running shoes – Inov8 Race ultra 290. I love inov8 shoes and these have a wider toe box which is advised for the heat in the desert. 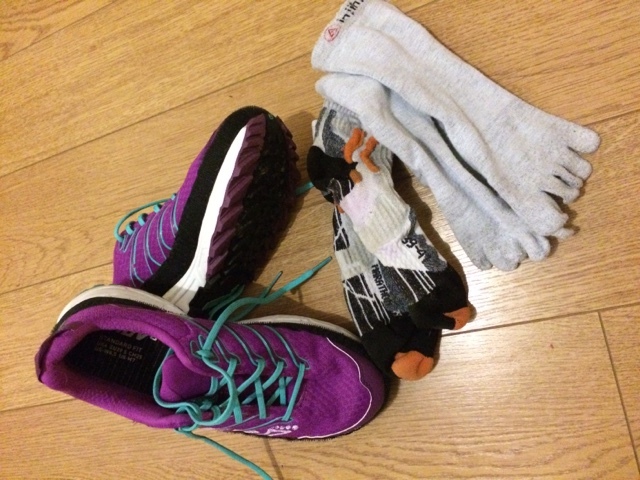 Socks – X Socks marathon outer with a Injinji liner. Again this is a combination that I tried on the Mourne 2day and found very comfortable with no issues at all. Shorts – X bionic Marathon shorts. They don’t make me run any faster but are incredibly comfortable with no chaffing or rubbing. Underwear – X bionic pants and an under armour sports bra (my lucky one). T shirt – Rab Aeon T shirt turquoise colour. Also performed well in the races I wore it in this year. Very light and quick to wick away sweat. Over the next 3/4 weeks I will also try out my food combination and make sure it agrees with me. I am a big foodie and need variety and taste where possible. I know my body needs a mix of sweet and savoury snacks when running and I will be trying my best to recreate this as much as possible with foods that I know I can stomach. Breakfast will be my usual porridge with a mix up of flavours and dried fruit and nuts. I will make this up myself and not buy pre packed. Dinner will be a dried meal from Expedition foods and I will try a few out to make sure they suit me. Calories will be high and I don’t intend to skimp on food. One of my biggest training weekends I have planned is for a back to back Mourne wall attempt. I have the option to cut out 2/3 summits on day two but it will be a great test for my legs and food combination. There are lots of other crazy sand and mountain miles planned but this one will be at the end of February and will signal the start of my gradual drop in mileage before the race. The road to the MDS is long and wide, The summer and autumn of races have given me a good base to start off with, I am so glad I got the mountain miles in as I feel the benefit from it and that can only be a good thing. 13 weeks to go. I fly out to Gatwick on Thursday 07th April and meet the 300 odd other Irish and British runners the next morning. I still have a lot of miles and climbing to do but as I say “keep er lit”. A personal trainer by trade, Claire enjoys outdoor activities with an element of challenge. A frequent hiker of the Mournes and the Sperrins, Claire also enjoys taking her dog Cash along for the trip.